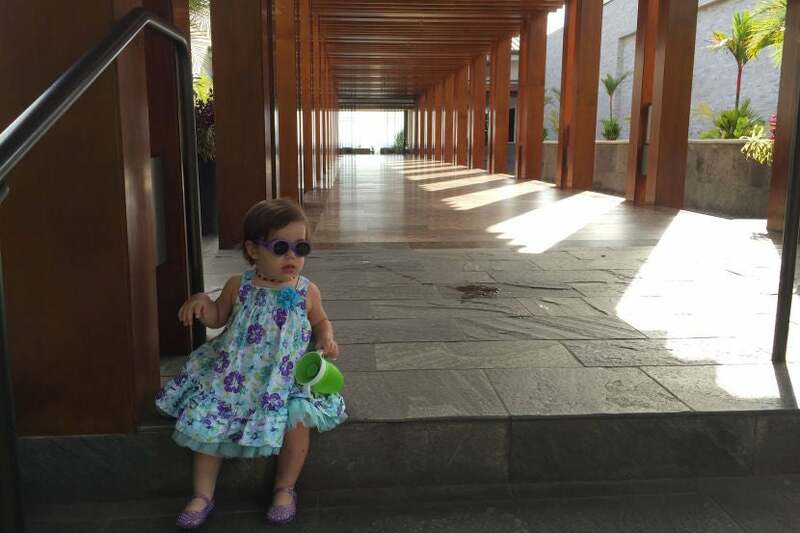 TO THE POINT: A Category 6 property located on the Hawaii’s Valley Isle, the Andaz Maui at Wailea Resort provides everything you’d need for what should have been the perfect family beach getaway. 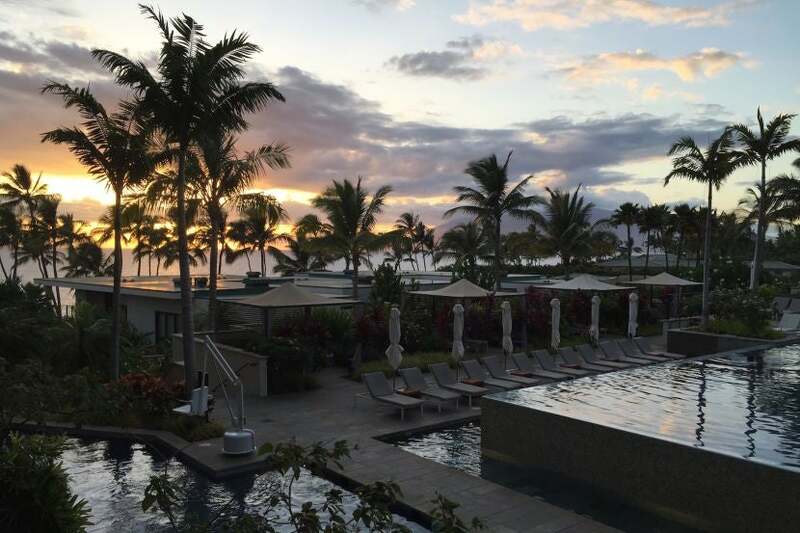 The pros: fabulous sunset views, flower leis at check-in and locally sourced bath products. 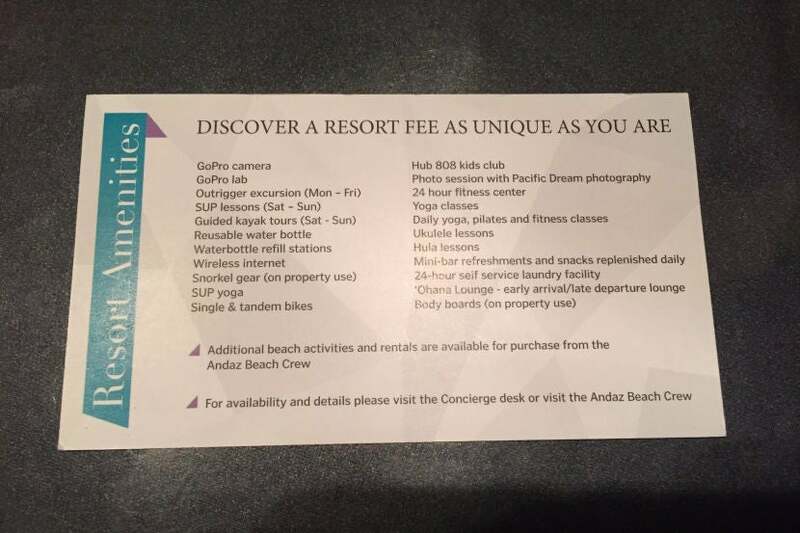 The cons: a hefty $40 daily resort fee and lousy service overall. I’ve become very fond of the Andaz brand after terrific stays in Savannah, Amsterdam and at both New York City hotels, including the Andaz 5th Avenue. After reading TPG’s review from last year, the Maui property was at the top of my list for a future trip to Hawaii. An opportunity soon presented itself — in the form of a companion fare benefit with the Alaska Airlines Visa Signature credit card and a well-timed status match to the carrier’s top-tier MVP Gold 75K level — and we were able to go. Despite the gorgeous property and surrounding island beauty, we (unfortunately) had our first less-than-stellar Andaz experience. Read on to see what happened. 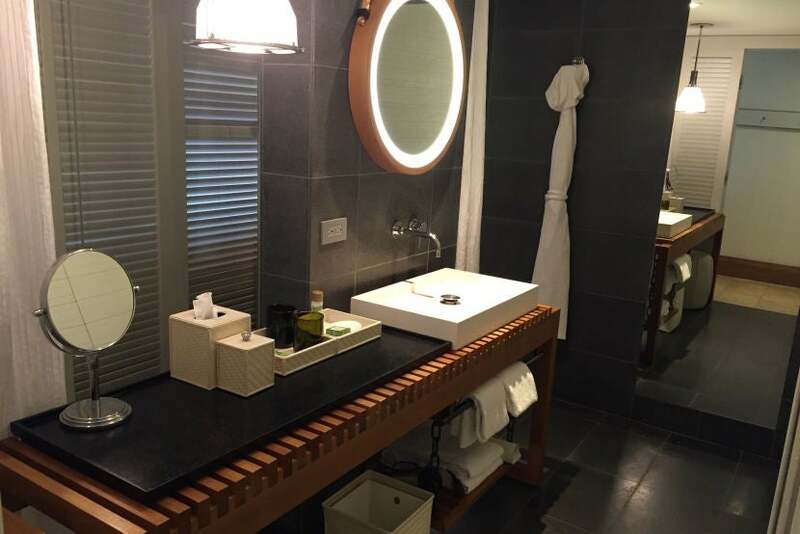 When I initially planned the trip, I had hoped to book award rooms using Hyatt Gold Passport points transferred from my Chase Ultimate Rewards account. 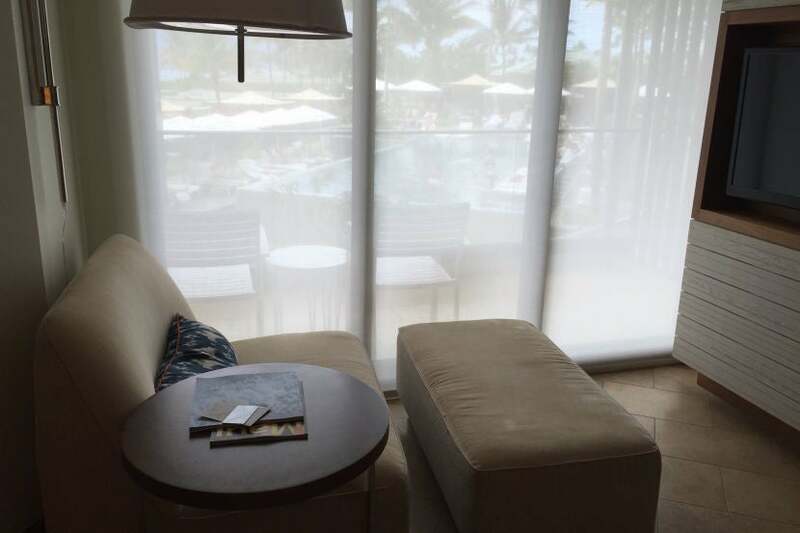 The Andaz Maui is a Category 6 property that normally requires 25,000 points for a free night in a mountain view room. 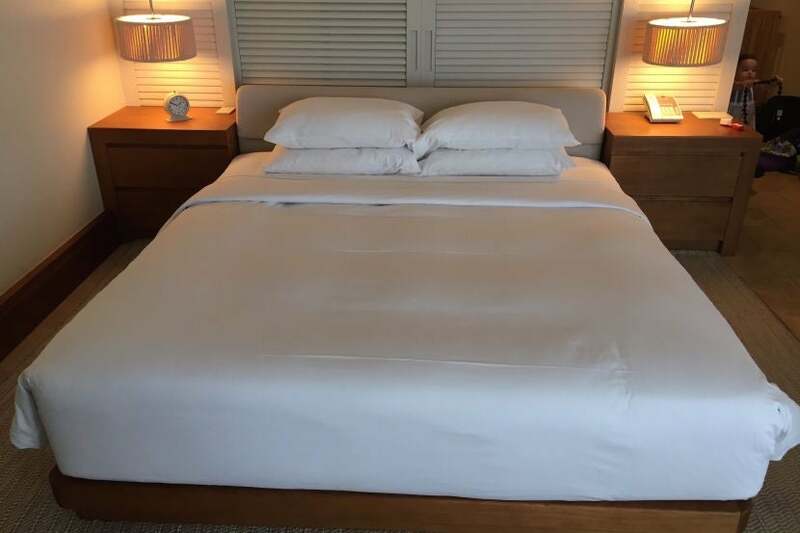 Unfortunately, as TPG Editor-in-Chief Zach Honig recently pointed out, this property makes it very difficult to book award rooms, especially for shorter stays. As a result, I decided to take advantage of the fourth night free benefit from my Citi Prestige Card for the first time and booked a paid stay, as this would also open up the possibility of using a Hyatt Diamond Suite Upgrade. At the time of booking, I had several room options from which to choose. The cheapest was a mountain view room for $427 per night, but for a small premium, I could book a partial ocean view room — I figured this was a smart move in case the hotel was sold out and couldn’t offer an upgrade at check-in (a prophetic decision in hindsight). 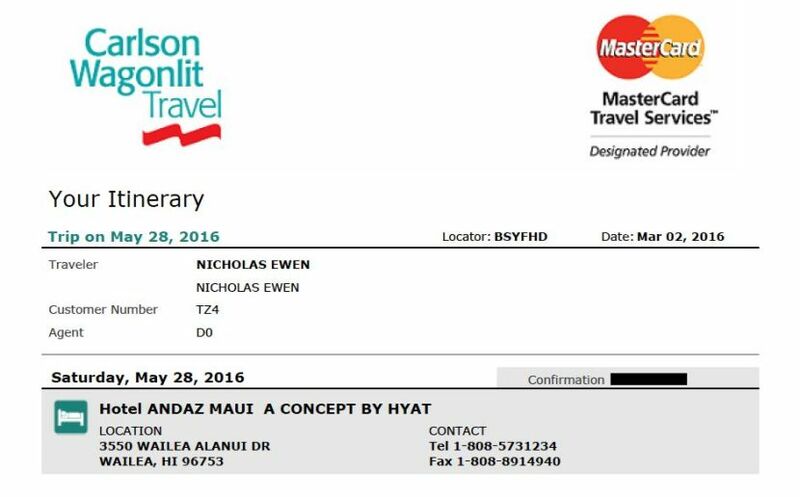 Booking with a Carlson Wagonlit travel agent was a breeze, and I soon had an email that confirmed my rate for four nights ($454.10) as well as the total statement credit I would receive ($515.02). However, I continued to monitor the hotel’s inventory for a better rate and to see if one of the its three poolside suites had opened up (they never did). Six weeks after the initial reservation, I noticed the rate on my room had dropped to $427.10 per night, so I called the Citi Prestige Concierge and was able to modify my existing reservation. Then, just a few weeks later, I noticed a limited-time special rate of $409 per night plus a $200 resort credit. Once again, the agent to whom I spoke was easily able to modify my reservation. Note that the hotel imposes a $40 daily resort fee (plus tax) that is typically excluded from the fourth night free benefit. However, the confirmation I received from Carlson Wagonlit included it as part of the credit I would receive, so it’ll be interesting to see how that pans out. I also earned 3x ThankYou points by paying with my Citi Prestige Card, so booking this way was a great way to maximize both rebates and earning rates. Our flight from San Diego landed around 10:30am, and after grabbing our rental car and a quick bite in nearby Kihei, we pulled up to the entrance of the hotel around 12:45pm. We were immediately greeted by valet attendants who presented both my wife and 18-month old daughter Evy with flower leis. I was given a necklace of plastic stones. A handful of steps took us to the gorgeous open-air hallway leading to the lobby. 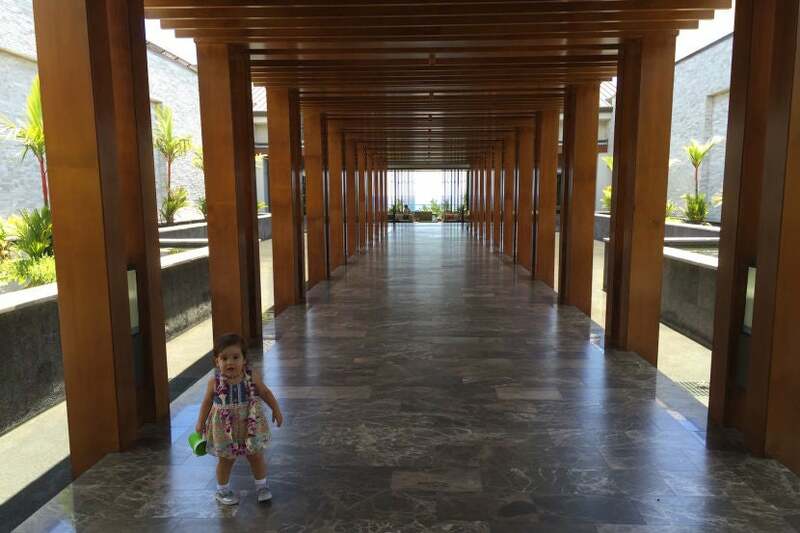 The dark marble and warm wood columns actually worked very well together, though Evy was most intrigued by the shallow decorative pools running the length of the walkway. A beautiful entranceway hinted at what was to come. At the other end was the airy lobby, centered around a square box of soft white sand with a curvy bronze sculpture suspended above it. The sandbox (for lack of a better term) was surrounded by couches and chairs, though I was most interested in the seating areas on the other side and the spectacular water views. 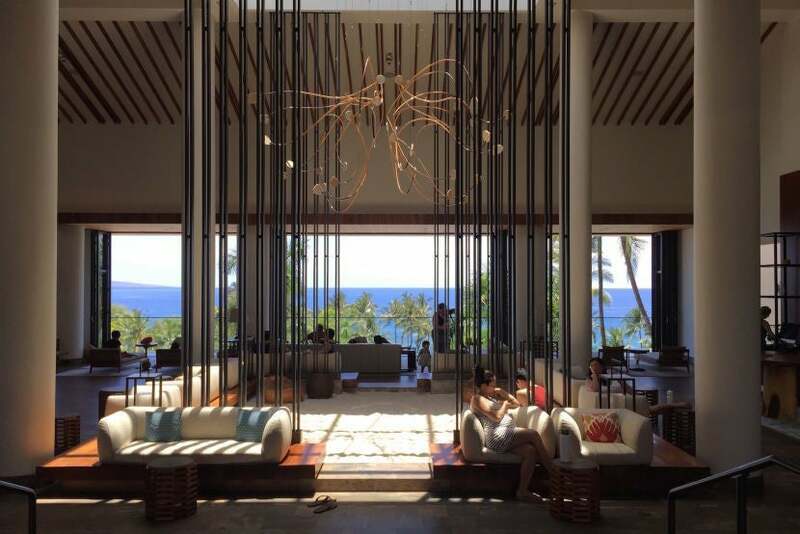 The spectacular open-air lobby of the Andaz Maui at Wailea Resort. We were greeted by a friendly front desk assistant manager and offered cool towels and lavender lemonade while she processed our check-in. She immediately recognized my Hyatt Diamond status and thanked me for my loyalty, but apologized that the hotel was completely sold out and she wasn’t able to offer us any type of upgrade. This news was disappointing, yet gratifying, since I knew I’d already booked us a room with at least a partial view of the ocean. Unfortunately, the hotel was also sold out the previous evening and as a result, none of the rooms were ready (we’d arrived three hours ahead of the published check-in time of 4:00pm). She called housekeeping, slotted us in for a room that was currently being cleaned and took my cell phone number, promising to call as soon as the room was ready. After running a few errands, we arrived back at the hotel around 1:45pm and were plotting our next move when the same agent came by to let us know that our room was all set. She gave us our keys and promised that the bags, Evy’s crib and our welcome amenity of a bottle of wine and some snacks would be right behind us. Due to the hillside setting, the lobby of the Andaz Maui is actually on the fifth floor and we were assigned to Room 229 on the second floor of the Makai Wing (translation: “toward the sea”). After a short elevator ride, we stepped into a hallway that was perpetually lit with calm mood lighting, which never seemed to have the desired effect on Evy as we left or returned to the room — apologies to our neighbors! 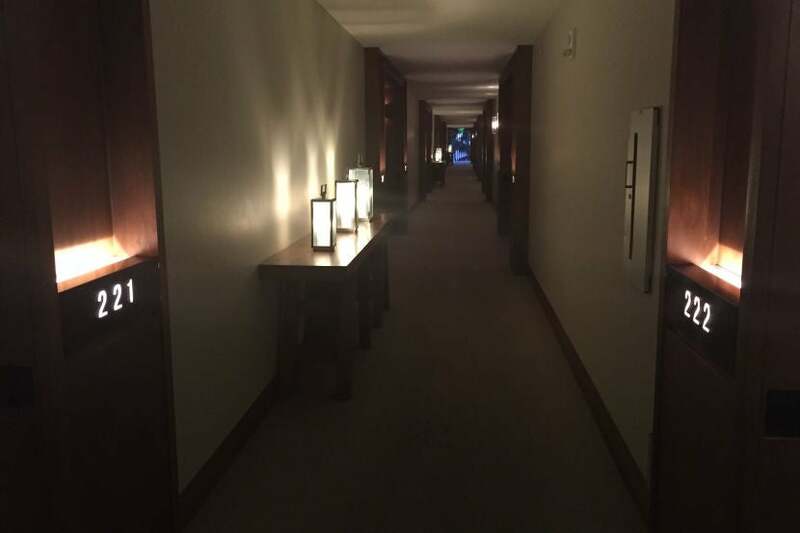 Mood lighting in the hallway of the Andaz Maui. The door swung open into a narrow entryway — the bathroom was located immediately to the right through swinging doors with wooden slats that looked like louvered shutters. 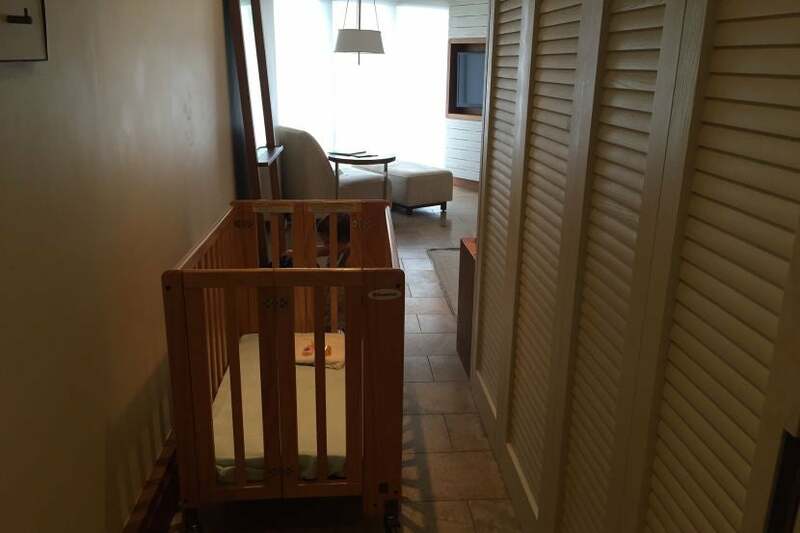 The crib made the room’s hallway seem even more narrow. Inside the bathroom, the toilet and closet were off the to right, while the single sink was next to a lengthy-yet-cluttered counter along the left side of the room. Here’s a peek at our bathroom. The shower was similarly lengthy and situated around the corner past the sink, giving the entire bathroom a strange, U-shaped floor plan. 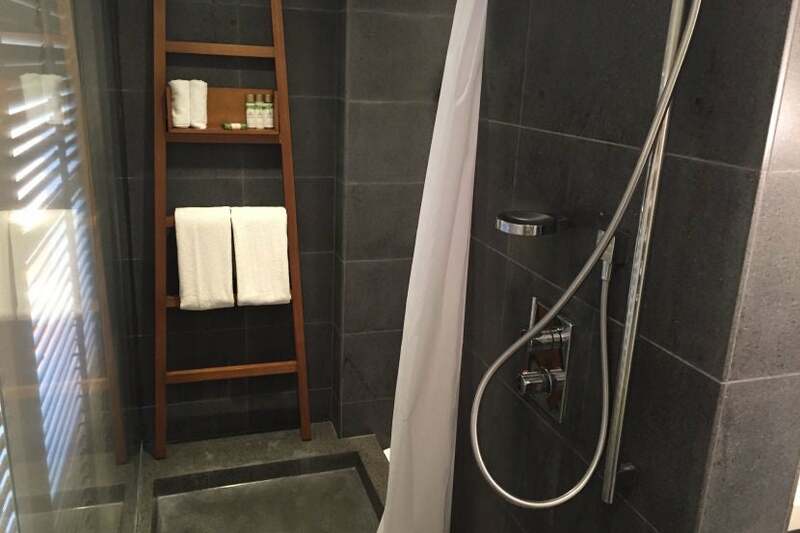 The shower was unnecessarily long and narrow. 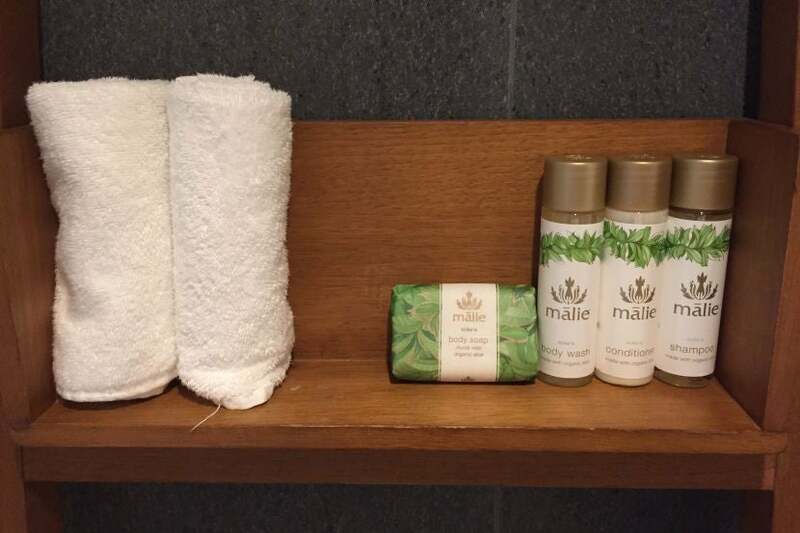 The bath products were organic and from a local Hawaiian brand called Malie. I appreciated that they weren’t overly floral or aromatic as I find some hotel products to be. The provided bath products were quite nice. Despite the narrow entrance, the room quickly opened up once you reached the main living area. Even though the room featured a standard floor plan, its geometric size did a terrific job at maximizing space and felt much more open than I was expecting. Naturally, Evy immediately started exploring. Despite a slightly odd shape, the floor plan was actually quite spacious. On the right facing the sliding glass doors was the king-size bed, featuring two built-in nightstands and interesting light fixtures with tightly wound rope that allowed the perfect amount of light for reading after Evy went to bed. 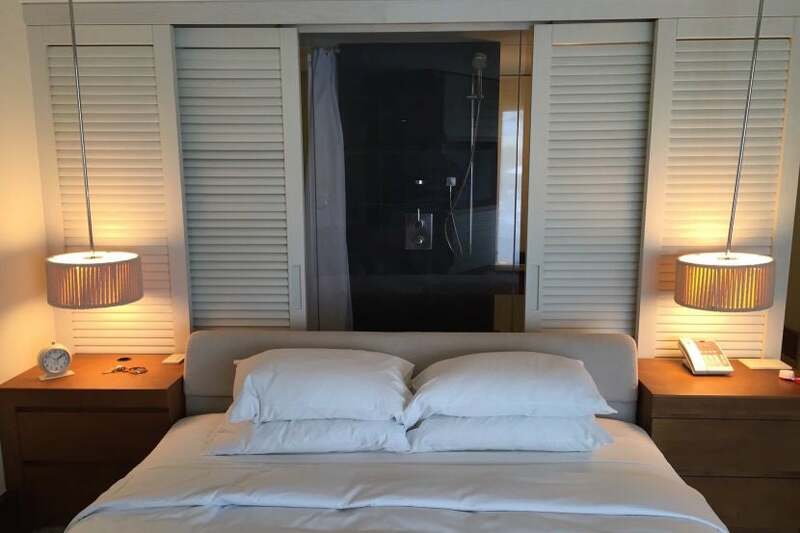 The comfortable king-size bed faced the sliding glass doors. The sliding doors behind the bed actually opened to display the glass-walled shower. This was a rather interesting design feature and could definitely present some awkwardness if you’re rooming with a friend or family member. Talk about a strange lack of privacy in the shower! 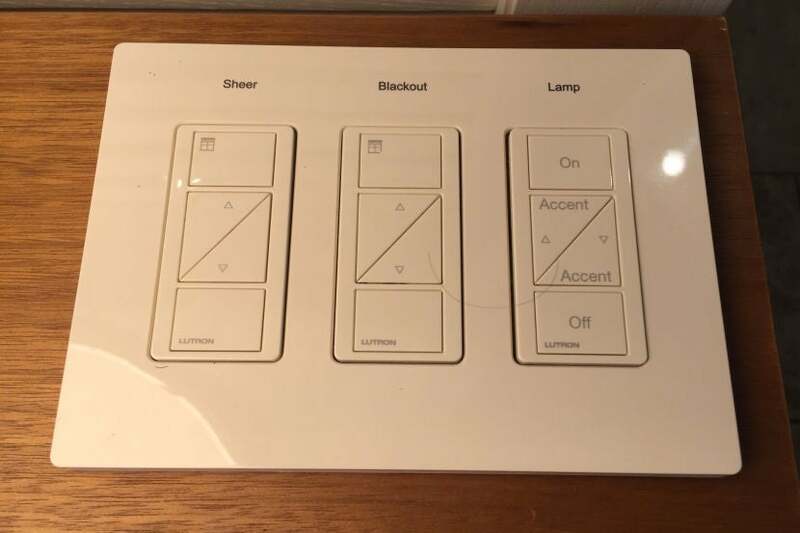 The nightstands housed the controls for the lights and curtains in the room, and as I’ve found to be the standard at Andaz properties, were a bit more complicated than your average on/off switches. These controls were actually pretty easy to use compared to the other ones by the door. At the foot of the bed along the right-hand wall was a built in desk and shelving unit. 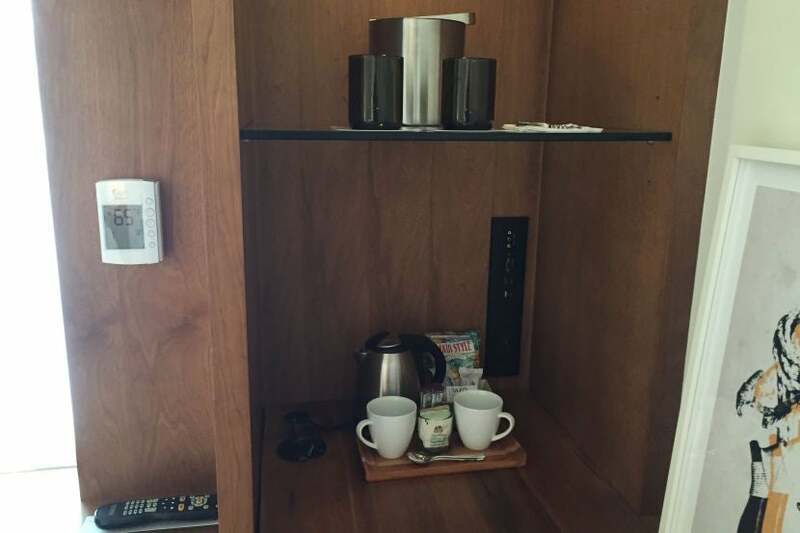 Having complimentary snacks in the room is a standard at Andaz hotels — at the Maui location, this consisted of two bags of Maui-style potato chips placed next to the coffee and tea supplies. The free potato chips were a great happy hour snack. 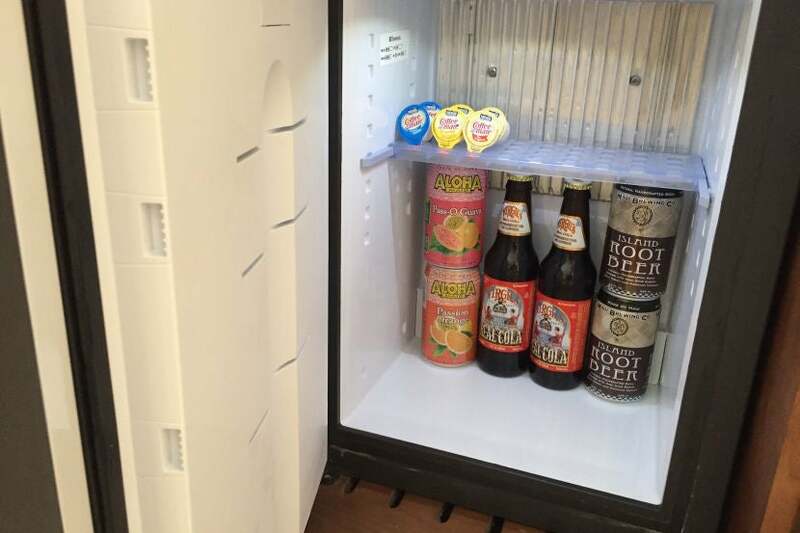 There was a small mini-fridge set into the desk with guava juice, cola and root beer, also complimentary. There were several free, non-alcoholic drinks available in the mini-fridge. Across from the television was an armless chair with an ottoman and a round table, seemingly placed to watch TV. We wound up using them as a storage bench and changing table area for Evy. The interesting sitting area in our room. Beyond the chair was one of our favorite aspects of the room: the balcony. 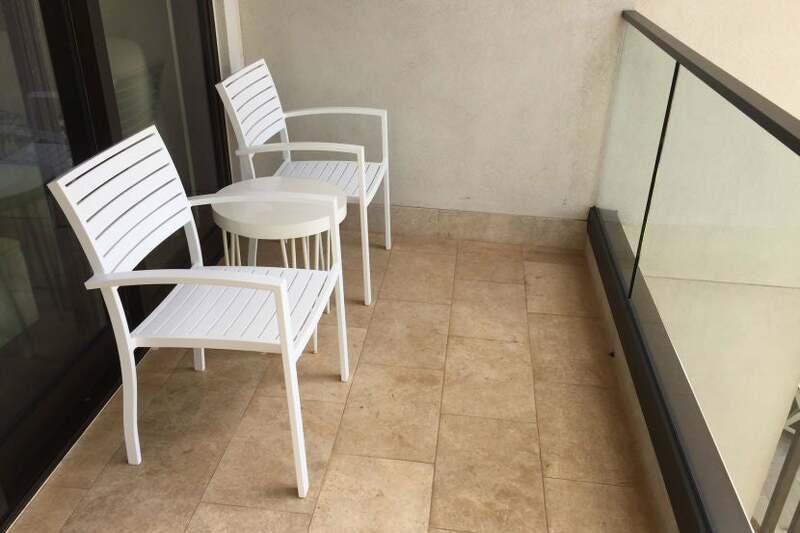 There were two simple, white metal chairs and a matching table at one end. We spent a decent amount of time on the balcony. The balcony was also angled toward the water, hence the partial ocean view designation. We were particularly lucky because the even-numbered rooms on our wing also provided terrific views of the sunset. The incredible sunset view from our balcony. 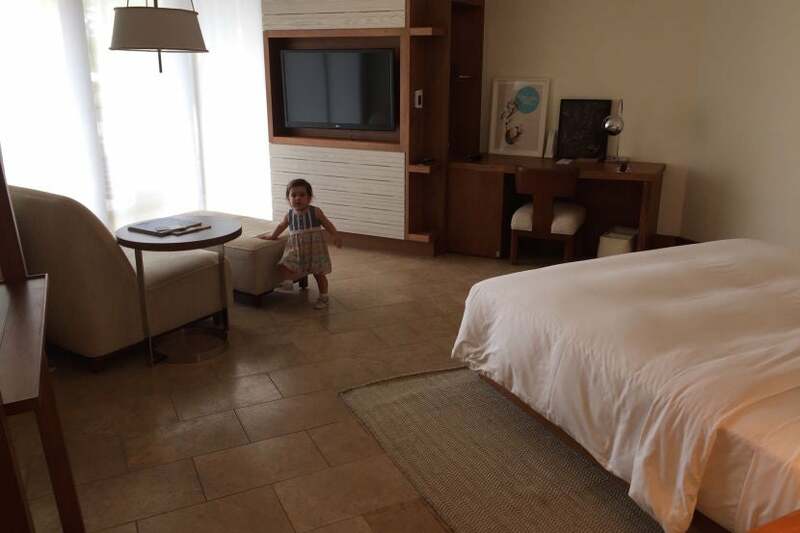 Despite traveling with an 18-month old, our room was situated directly overlooking the adults-only pool of the resort, which could’ve interrupted the serenity of the area. Fortunately, the balcony was fitted with glass rather than railings, preventing any toddler noise from traveling beyond the confines of our room. Within a few minutes of getting settled into our room, our luggage was delivered. Our welcome amenities arrived roughly 10 minutes later and consisted of a bottle of white wine, a bottle of sparkling rosé, a fruit tray, chocolate truffles, sugar cookies, two bottles of milk for Evy and a bowl of blue Jello with graham cracker crumbs meticulously placed to resemble the beach. I sincerely doubt that this is the standard welcome amenity for Diamond members, but it certainly did start things off right. 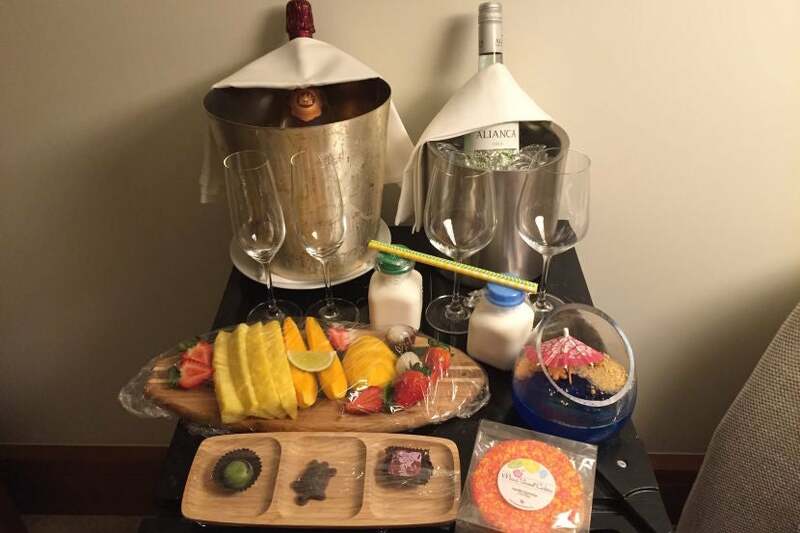 Pretty impressive stuff for a welcome amenity. The property itself is stunning and provides many spots to relax your cares away. Evy was not a fan of the sand nor the ocean, so we didn’t spend any time on Mokapu Beach, though it looked beautiful. 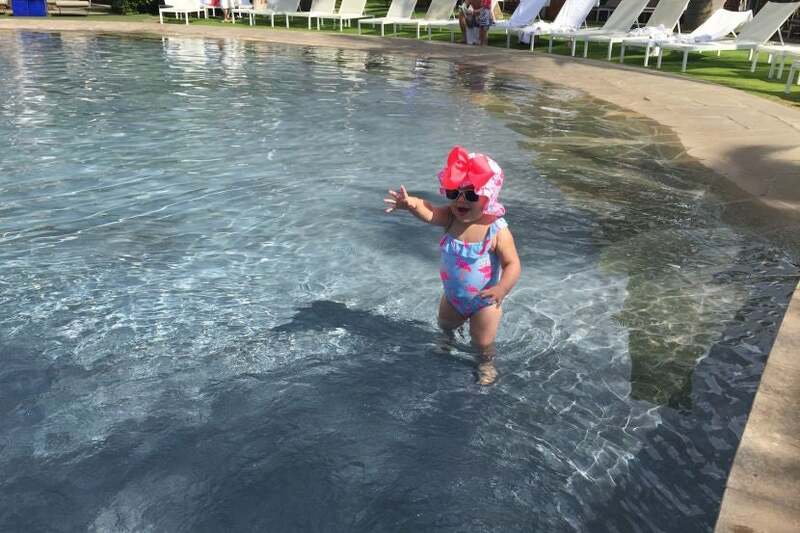 She is a water rat when it comes to pools, however, and in this respect, the Andaz Maui didn’t disappoint. In addition to the adults-only pool on the north side of the property, there were four other pools, each on a separate “tier” leading down to the main pool at the bottom. The four-tiered main pool area of the Andaz Maui at Wailea Resort. The lowest pool was the largest and where we (and other families) spent the bulk of our time, as one end of it is a gentle slope where kids can gradually make their way into the water. The ability to wade into the water made the main pool very family friendly. There was ample seating around all of the pools, and the property provided extra-large towels to cover the chaise lounges as well as regular-sized towels for drying off. 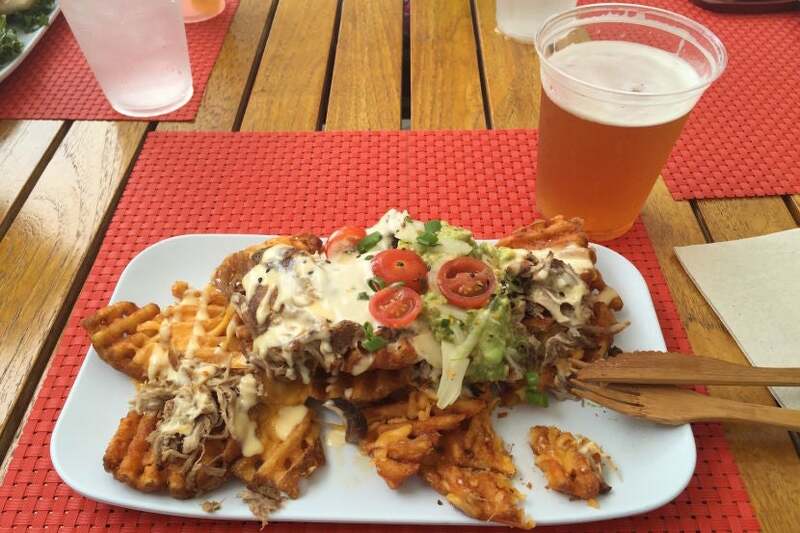 You can also grab a drink or a bite to eat at the Bumbye Beach Bar (by the bottom pool) or Lehua Lounge (near the top pool), the latter of which served pub fare with a Hawaiian twist, like delicious Kalua pork fries. Lunch at Lehua Lounge was quite delicious. 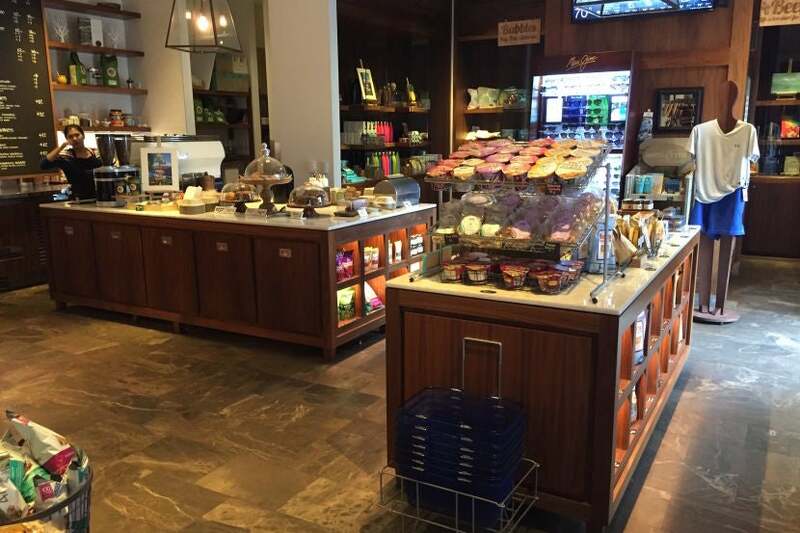 You can also grab a quick snack or pick up a forgotten amenity at Mokapu Market, open 24/7 and located just off the lobby. Having a market on-property was nice, though if you have a car, you’ll find cheaper groceries in nearby Kihei. There were also two full-service restaurants on the property: Morimoto and Ka’ana Kitchen, where breakfast was served each morning. A friend of mine spoke very highly of the breakfast buffet when we were planning the trip, and it didn’t disappoint, offering an incredible mix of fresh fruit, pastries, juices, made-to-order omelets and a variety of unique hot dishes. Naturally, I had to try it all to make the most of the $47 price tag, although this was free for us because of my Hyatt Diamond status. 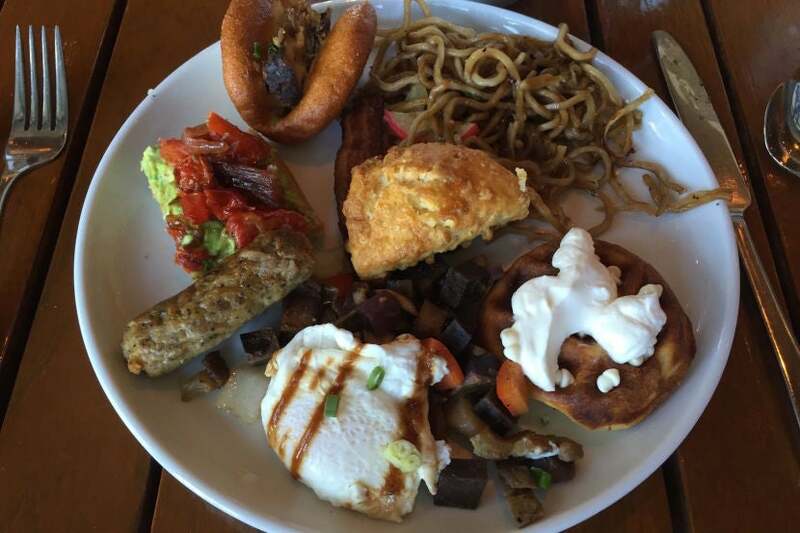 The breakfast buffet was one of the best we’ve seen. My Hyatt Diamond status also included a 10% discount at the property’s spa, which my wife gladly took advantage of. As expected, the prices were quite high, ranging from a $55 manicure to the $625, five-hour “Indulge” package (my wife’s 90-minute massage was around $300, factoring in both the discount and the automatic 20% gratuity). As I mentioned above, the Andaz Maui does impose a $40 resort fee which gives guests access to an array of amenities, including daily GoPro rentals, outrigger canoe excursions (Monday thru Friday), stand-up paddle board lessons (weekends only) and yoga classes. A card listing these activities was provided in our key packet at check-in. The resort fee included many perks, though bad weather prevented us from trying some of them. The complimentary water bottles were a nice touch, and with filtered water machines located on the even floors, it was quite simple for us to refill them throughout our stay. Refillable water bottles helped prevent the waste of bottled water. Despite the fantastic amenities of the resort, my wife and I found the service there to be lackluster at best. During all three visits to the pool, we were never approached or offered drinks, though we did see waiters and waitresses providing poolside beverage service. We also didn’t get turn-down service the first two nights — after inquiring with the concierge, we were told that this was available “on request” rather than being done automatically. There was no information in the room about the hotel’s amenities, so it felt a bit like they were tacking on a resort fee for services that weren’t clearly articulated, and even when we knew about them, they weren’t executed very well. We also found the valet car service to be quite poor. We decided to rent a car so we could explore the island a bit and I’d typically call to request the car at least 10 minutes ahead of our planned departure time. More often than not, we’d arrive at the entrance only to wait another 5-10 minutes. Since the property doesn’t offer self-parking, only giving you the option of valet parking and charging a whopping $30 a day for it, this was quite disappointing. Evy (unfortunately) got very used to waiting for the car to be brought around. All in all, it simply felt like the property was understaffed. Despite being sold out, we never felt the crowds when it came to the pools, the lobby or any other public area — we never even had a problem getting a table at breakfast, whether it was 7:00am or 10:00am. However, if the service shortcomings were due to a full house over Memorial Day weekend, that’s a pretty substantial concern. The Andaz Maui is a gorgeous property in a terrific part of the island. Unfortunately, the hotel makes it quite challenging to book award rooms using Hyatt Gold Passport points, and paid rates are quite high. Given the less-than-stellar service we encountered during our stay there, I’d have to say that this is the first Andaz property we’ve visited where we’re not jumping at the chance to return. 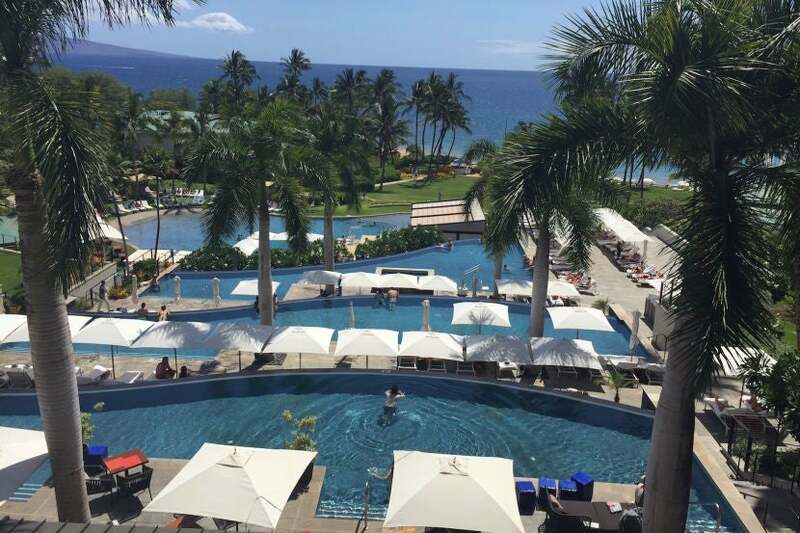 Have you stayed at the Andaz Maui at Wailea Resort? Share your experiences with us, below. Featured image courtesy of Andaz Maui at Wailea Resort.